The Potomac Officers Club hosted the 2019 Data Management Forum on Wednesday to gather the GovCon leaders from the public and private sectors to discuss the challenges surrounding data management for federal agencies. Following an informative keynote address from Michael Conlin, chief data officer of the Department of Defense, an expert panel took the stage to address augmented data management, the role of data professionals and how artificial intelligence and machine learning continue to transform the data management landscape. After a riveting discussion featuring Beth Killoran of GSA, Todd Myers of NGA, Donna Roy of DHS, Eileen Vidrine of the U.S. Air Force and Shaun Bierweiler of Cloudera, who served as moderator, the panelists discovered that data management is in the early stages, and it will take time to understand the true value of data for federal agencies to implement new processes efficiently. As the chief data officer, Vidrine is aware that data is at the heart of how the Air Force moves forward. The Air Force is investing in data, machine learning and AI, but she acknowledged the agency needs great volumes of curated data to move forward. As a result, she is leading the effort to make data visible, accessible and understandable across the service branch. Vidrine also stressed the importance of thinking ahead and studying the security elements of innovation, especially in her environment. She explained that if a tool is available and the Air Force wants to be proactive while the data matures, it is important to look into the security elements because the logistics could fail when the data is available. “You have to find that balance between ‘When do I start, or did I start too late?’” Vidrine advised. Donna Roy acknowledges that the move to implement data management processes, AI and machine learning is only beginning. DHS recorded some success at the rudimentary levels of data management by assessing large volumes of data to understand where data quality issues are and creating profiles that allow for improvement. She said federal agencies need to improve their understanding of how to clean, curate and properly manage data while also implementing cloud platforms as soon as possible. “It’s really a journey for affordable computing and storage to solve big problems with big data,” Roy said. One point of emphasis that Todd Myers noted is that augmented data management calls for a better understanding of the data pipeline and supply chain to start processing and running analytics against that data more quickly and with greater accuracy. Myers is concerned with how GovCon leaders stay ahead of the technology curve. “We need to avoid thinking that because we hired a large system integrator or that we are doing a big contract that we’re going to automatically stay ahead of the curve,” he said. He believes that introducing people with developer skill sets and redefining contracts to follow in industry footsteps can break the mold and help keep federal agencies consistently ahead of the curve. Beth Killoran said the most valuable government asset is data. She insists that sharing data is important, but it is just as important to protect our information, and we need to know the realm of possibilities for our data and its true value. At the beginning stages of data management, it will take time to understand how to use the data efficiently. Killoran understands that government is dealing with several issues, and the goal is to be as efficient as possible with taxpayer dollars. GovCon leaders understand what the problems are, but the important issue will be understanding why these problems exist and then apply machine learning, artificial intelligence and improve data management over time to solve these problems. 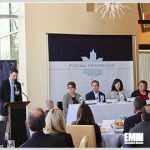 The Potomac Officers Club will host the 2019 Cybersecurity Summit on May 8th. You can reserve your seat for the event here.